It was our wedding anniversary last Monday, so I decided to book a couple of nights in a nice hotel in the Sydney CBD so we could have some time away from the house and my computer over the long weekend. We stayed at the Westin Hotel on Martin Place – which was very nice (and rather expensive) … our room was great, and the price included a full buffet breakfast, one free in house movie and free hot chocolates delivered to our room for each night we stayed … so we really enjoyed ourselves. On Sunday morning after a big breakfast we decided to go for a walk and visit some of the art galleries and museums – first wandering down to Circular Quay and stopping at the Museum of Contemporary Art for a bit, before walking around the Opera House and through the Botanic Gardens. We then headed to the Art Gallery of NSW and spent a couple of hours there looking at the paintings. It was about 1pm or so I guess when we were walking through a quiet wing of the gallery that I noticed a spot on the wall where a painting was obviously supposed to be hanging. I laughed and commented to Leanne that perhaps someone stole it – but really I just figured that they had taken it off exhibition for restoration or cleaning or something. We thought nothing more of it until the news later this week! 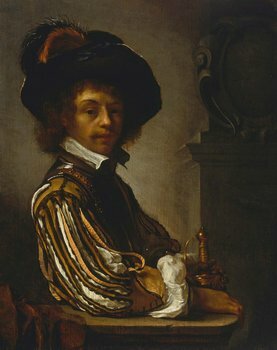 The Art Gallery of New South Wales is refusing to confirm reports that a painting by a Dutch master has been stolen. The gallery has organised a media conference for tomorrow morning and police will also be present. A valuable 17th-century painting has been stolen from the Art Gallery of New South Wales. A Cavalier (Self Portrait) by Dutch artist Frans van Mieris the Elder was reportedly stolen in the past week. The gallery says a police investigation has begun into the theft. Officers from The Rocks police station in central Sydney are leading the investigation and a press conference has been scheduled for later this morning. The painting was donated to the Art Gallery of NSW in 1993 by philanthropist James Fairfax. Police say they suspect an expert thief was behind the heist of a $1.4 million 17th-century Dutch masterpiece from the Art Gallery of New South Wales on Sunday. 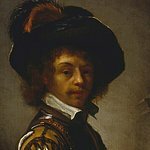 Sydney officers are leading an investigation into the theft of A Cavalier (Self Portrait) by Frans van Mieris the Elder. “The artwork was expertly removed from the art gallery wall and we’re following all lines of inquiry to establish who is responsible for the theft,” Acting Superintendent Simon Hardman said. He would not rule out the possibility that a gallery insider could have been involved in the theft. There were no security cameras in the room where the painting was displayed. Gallery director Edmund Capon says it is unlikely the painting could be sold. Philanthropist James Fairfax donated the painting to the gallery in 1993. The police are saying they think it was stolen between 10am and 12:30pm … we were there sometime after 1pm … so it was freshly stolen when we saw it missing!! … certainly adds a bit of mystery to our visit!! I’m just wondering when Rene Russo is coming to town to catch the bad guy (or seduce him !?). I remember seeing that painting last time we were in Sydney.